Nexcare Waterproof Bandages stay on in water and keep water out, making them ideal for swimming, gardening, canoeing, fishing, water sports and hand washing. 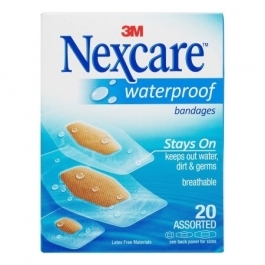 The Nexcare Waterproof bandage features a unique diamond shape, 360-degree seal, clear, breathable material and offers superior protection against water, dirt and germs that may lead to infection. A must-have for any first aid kit, Nexcare Waterproof bandages are perfect for treating minor wounds such as cuts, scrapes and blisters. Sizes include: 6 at 7/8" x 1-1/16"; 6 at 1-1/4" x 2-1/2"; 8 at 1-1/16" x 2-1/4". Superior protection against water, dirt and germs, Clear, breathable material. Ultra-thin and comfortable to wear. Unique shape designed for better seal around the pad. Seals out water, dirt and germs. Easy, one-hand application Nexcare Waterproof Bandages, Assorted 20 ct. Nexcare Waterproof Bandages stay on in water and keep water out, making them ideal for swimming, gardening, canoeing, fishing, water sports and hand washing. The Nexcare Waterproof bandage features a unique diamond shape, 360-degree seal, clear, breathable material and offers superior protection against water, dirt and germs that may lead to infection. A must-have for any first aid kit, Nexcare Waterproof bandages are perfect for treating minor wounds such as cuts, scrapes and blisters. Sizes include: 6 at 7/8" x 1-1/16"; 6 at 1-1/4" x 2-1/2"; 8 at 1-1/16" x 2-1/4".